Baby Milk Action is a non-profit organisation which aims to save lives and to end the avoidable suffering caused by inappropriate infant and young child feeding. Baby Milk Action works within a global network to strengthen independent, transparent and effective controls on the marketing of the baby feeding industry. The global network is called IBFAN (the International Baby Food Action Network) a network of over 200 citizens groups in more than 100 countries. Click here to download our leaflet: What we do - How to help. There is no food more locally produced or sustainable than breastmilk. A breastfed child is less likely to suffer from gastroenteritis, respiratory and ear infections, diabetes, allergies and other illnesses. In areas with unsafe water a bottle-fed child is up to 25 times more likely to die as a result of diarrhoea. Reversing the decline in breastfeeding could save 1.5 million lives around the world every year. Breastfeeding helps fulfill the UN Millennium Development Goals and has the potential to reduce under-5 mortality by 13%. A further 6% of deaths could be saved through appropriate complementary feeding. Breastfeeding also provides health benefits to the mother, such as reduced risk of some cancers. That is why a marketing code was introduced in 1981 to regulate the marketing of breastmilk substitutes. Companies continue to violate its provisions - see examples here. Find out how Baby Milk Action works to stop them and how you can help. Breastmilk substitutes are legitimate products for when a child is not breastfed and does not have access to expressed or donor breastmilk. 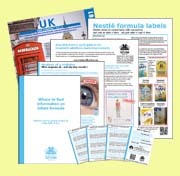 Companies should comply with composition and labelling requirements and other Code requirements to reduce risks - independently of government measures. Parents have a right to accurate, independent information. Baby Milk Action is not anti-baby milk. Our work protects all mothers and infants from irresponsible marketing.